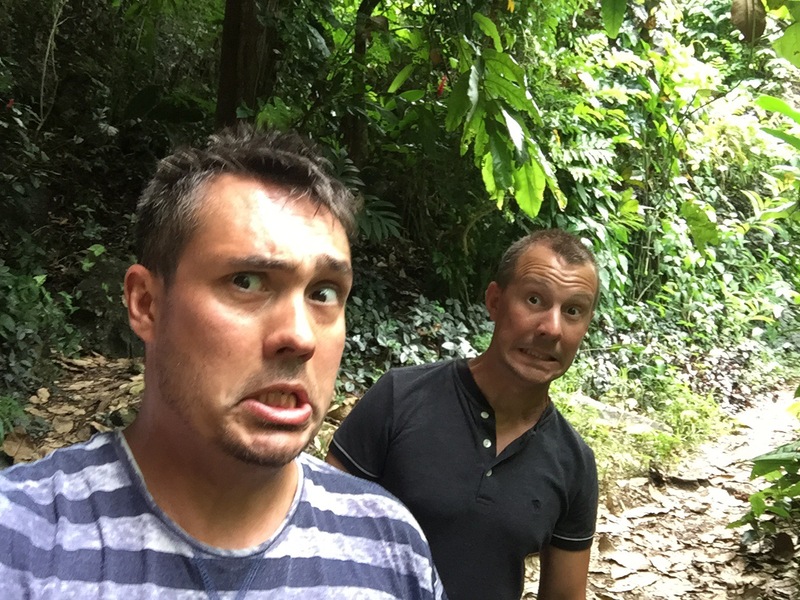 We had booked another tour at the start of our Fiji adventure- A caving Safari! We thought it was something different and would give us another view of the island. It was an early start with the company picking us up at 7:30. The taxi van was waiting with an old Fijian and his 14 year old grandson ‘Mack’ were waiting for us. 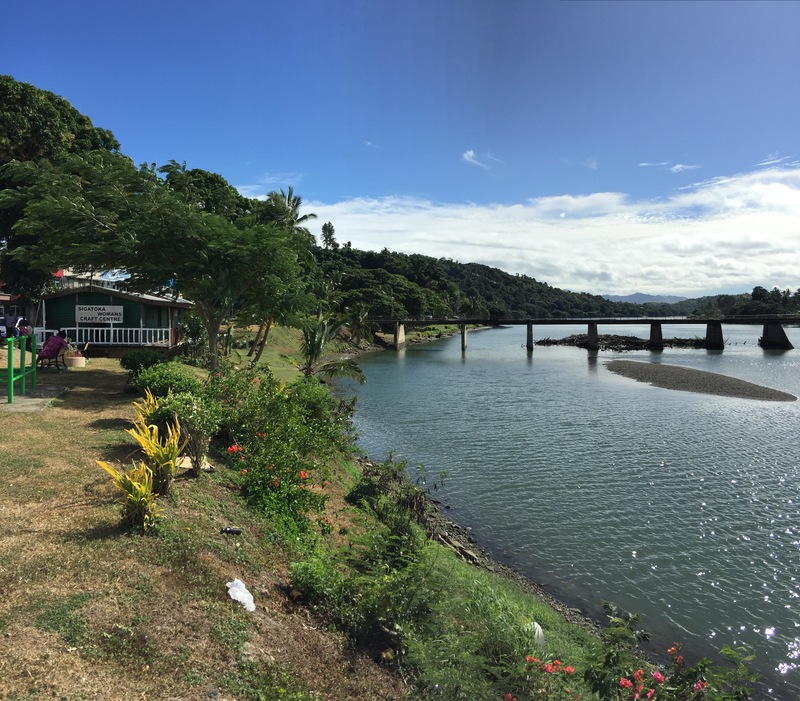 They drove us an hour around the island to the town of ‘Rugby’ or Sigatoka (nicknamed Rugby as it team are national champions). It soon became apparent we weren’t on the trip we thought we were. 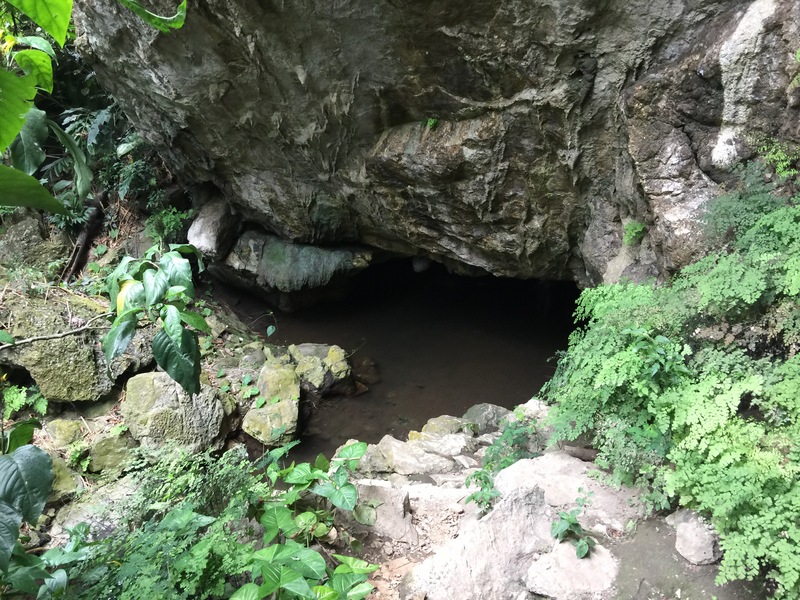 We were still going to see the cannibal caves but with a local family rather than an organised tour group. We were taken into the family/village shop where they sold traditional cannibal artefact replicas all made by the village we would later visit. Mac and his grandad went to get our lunch and we sat down with another villager who performed a Cava ceremony: a traditional drink made from the powdered root of a plant mixed with water. It looked like brown water and tastes of soil. But it is rude to refuse apparently! 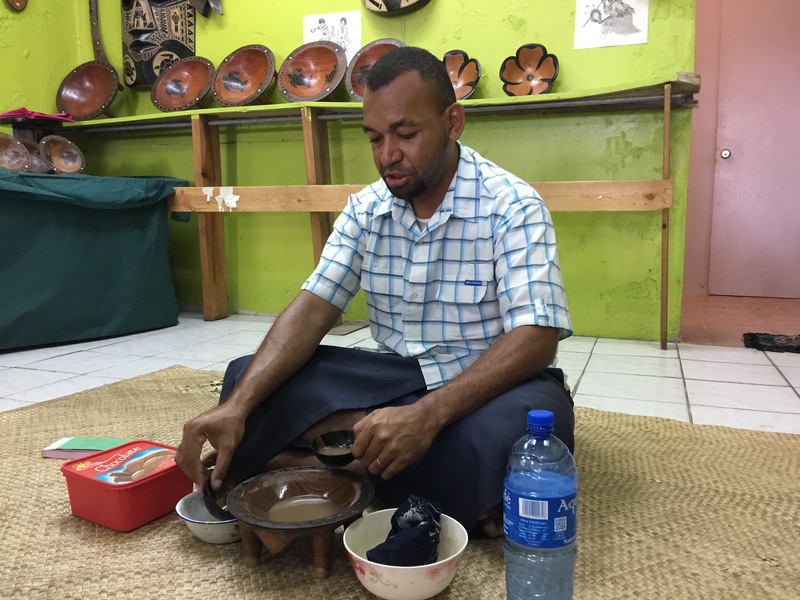 When each person drinks you also clap three times very loudly and chant something in Fijian. This blessed our day and gave us luck. It then became apparent that we needed to buy something from the shop. All proceeds went to the village and he was keen to stress it was all locally made and not made overseas like the other shops. We chose a small ‘neck breaker’ a sort of axe that you broke the humans neck with and then cracked open the skull. Mike W also got one and a small wooden turtle for luck. Gifts purchased, our host took us on a tour of the town and too the market, where all sorts of vegetables and fruits were being sold. Various roots and things we weren’t use to seeing were for sale including tapioca which I’d only seen in a can! Market explored for 10 minutes we hoped back in the van with Mac and Grandad and headed to the village. Another hour drive. The road quickly became dirt and we bumped our way down a one way track. Finally we turned into the village. A collection of single story prefab buildings and in various states of disrepair. We were taken into the chiefs house. He sat in the middle of an empty room in his wheel chair with no furniture around him and only a TV on the wall. Everyone else was sat on the floor. A brief polite chat and his daughter signalled to us she was ready. Her and Mac were taking us on the cave tour. First we walked through the village and into the farming fields past cows and crops. We went over some barbed wire and down to a river. Here we took a bamboo ‘ferry’: more like ten bamboo poles lashed together. 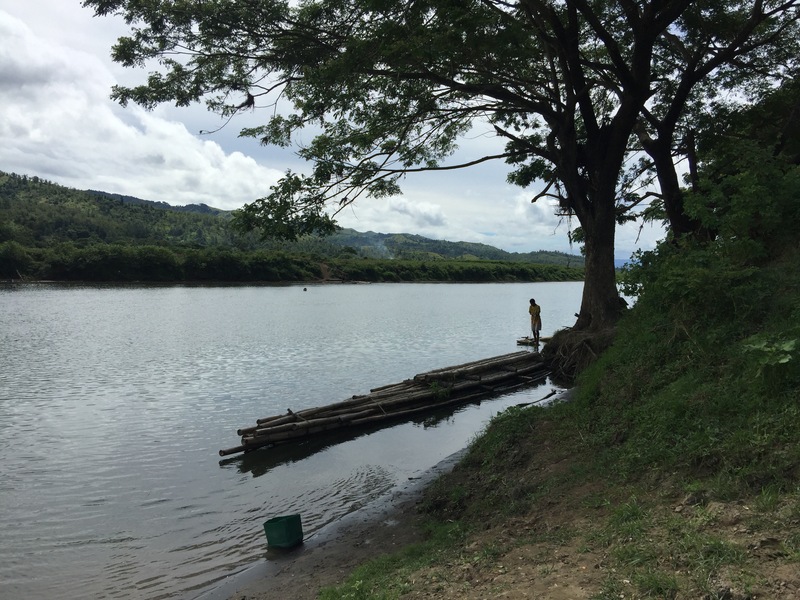 We had to walk over a log (with some help) to get into the ‘ferry’ and then a local who wadding in the river pulled us across. Our guides also waded across so it was just the three of us enjoying our ‘ferry’ ride. We asked if their were crocodiles and got an answer back of maybe so we kept our feet up! On the other side we jumped off onto the mud and made our way up the bank. Here we walked through more fields and some streams. We changed into flip flops and carried our trainers. Next came thick jungle with the a small beaten track. Beautiful jungle flowers and plants everywhere (as well as bugs!) until we reached a small clearing with a stream and the cave entrance. We rolled up our shorts and headed in. The stream came up to our thighs and at its deepest so it wasn’t to bad, it was also not cold. At this point Mike slipped and dropped his phone into the water. Miraculously it survived and was (and still is) still working. We had to bend down in half to get under the entrance and past a point the locals called the pregnancy gap. If you are pregnant you won’t be able to bend enough to get through so your parents will know you are pregnant. Luckily we all managed so no unexpected news! The cannibals who used to inhabit the cave would wait the other side and when enemies tried to gain entry they spear them as they came through as they would be bent down. The cave was pitch black and only illuminated by our torches. Some walls glittered with minerals and others formed strange patterns as the water dropped down. 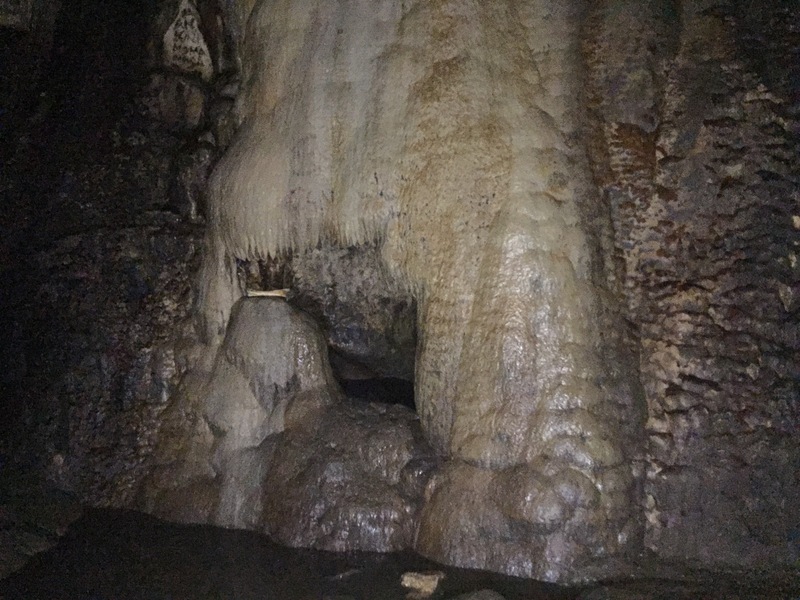 Stalagmite and stalactites could be seen growing all over the cave as the drip drip continued. The chiefs daughter, our guide, took us to several points of interest in the cave. Where they had meetings, where they cooked and the where the chief used to live. At the place where they cooked you could see the cannibal oven. Apparently where enemies were cooked in a mini cave within the cave. For effect a large animal bone (at least we hoped it was animal) was placed near by. Mack also hid inside so as we arrived he gave us a freight in the pitch black. In an attempt to get a better photo Mike stepped in some water and slipped into some very smelly mud! Hands and legs covered he washed off in the stream. At the back of the cave where the chief resided, our guide produced a conch shell. The chief would use it to get others attention. The other tour group (who were on the tour we thought we were on) were not allowed to blow the shell as only someone from the chiefs family can. We turned off our torches and waited in the pitch black. All you could here was the dripping of water until our guide blew the shell. A huge bellow echoed around us and lasted for several seconds. She blew it three or four times and it was quite eerie in the pitch black. Torches back on we wadded out of the cave (Mike slip free this time) back into the baking Fijian sun. A throughly worth while tour. We made our way back through the jungle and across the bamboo ‘ferry’. We managed to traverse the log on the other side and made it back to the village. Lunch was laid out and ready on a pretty blanket on the floor. Sausages, tuna and egg sandwiches, battered fish and fruit. The family watched the three of us eat and then devoured our leftovers. After some pleasantries we headed the two hours back to our back packers by the beach. That evening (it being our last in Fiji and with Mike W) we had some drinks on the beach with a friend we had met. Several drinks later we ended up in Ed’s bar (a local hangout) where they served the strongest rum and cokes we had ever had. The following day we lounged by the pool and nursed our hangovers with pizza and coke before getting our flight to New Zealand, and Mike W getting his back to Brisbane (and then onward to the UK). Fiji was amazing and definitely somewhere we would go back to, especially as we didn’t get to do any diving.